"I﻿﻿﻿﻿﻿﻿ took the time to research what you need to know to: understand pay stub, calculate time worked and create monthly & biweekly budget . With a total of ﻿5 instructional lessons in 1.5 hours, I am confident you will ﻿feel ﻿﻿empowered ﻿to tackle this﻿﻿ life﻿﻿ skill"﻿﻿﻿﻿﻿﻿﻿﻿﻿﻿. This life skill is very necessary for your adult life because how you manage your finances have a great impact on your standard of living. Many people do not understand that it is not so much how much you earn but how much you are able to keep from what you earn. This course will help you understand the money you are making, the amounts deducted from your paycheck and how you can effectively budget for current and future financial needs with what you take home. There are alot of information and even software available to help you manage your money. 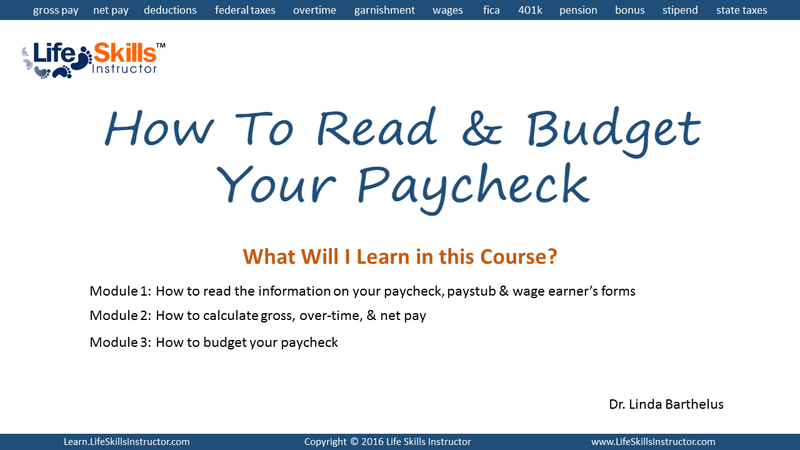 This course takes time to break down the basics on how to read your paycheck, explain the different deductions withdrawn from your gross pay. We go a step further explaining how to bypass check cashing stores even if you do not have a checking account... all in a concise and easy to understand format. You may not know how to create a budget, or if you do have a budget it may not be working for you. This course provides step by step example of how to create a financial budget that you works for you. With the specific knowledge you gain from this course on how the money on your paycheck works, you will feel more empowered to tackle financial decisions. One of the keys of being an empowered adult is to effectively plan for your future. Many adults live paycheck to paycheck without setting any money aside for emergencies. This course shows you how to add a savings plan into the budget you create so you can effectively tackle life's unexpected happenings. Watched the free monthly budget course and then decided to get the bi-weekly budget lesson since that is how I am paid at work. I followed along using Google Sheets instead of Excel to create my budget. Like the part about setting up savings for emergencies.